Childbirth is a life-changing event in which every woman who delivers a child, no matter how that child is born, must be brought to the precipice of sorrow and brought back again to life, forever altered by the child formed in her womb by God. It is my hope to be able to encourage you during that life-changing and altering event to have Christian affirmations or things to think on before, during the process of your delivery, and afterward. Each birth, no matter how many you have had, changes you. Writing down affirmations and posting them at the birth is a practice that many women do. It is a way while you are going through the birth process to think positively during the pain of contractions. Right and good thoughts open up the body to be able to allow the baby to come through the body naturally while fear and anxiety will work against the uterus holding the baby and hurting your body. I want to encourage you if you are a Christian woman to focus on the Lord through your labor, whether you have chosen a natural labor or an epidural, or are having a c-section we all are faced with fear, unsurety, and pain. In a matter of weeks, Lord willing, we will celebrate the birth of our fifth child, our third daughter into our family. We have decided if all goes according to plan that we will have her at home for our third homebirth. I never heard about doing this until I was introduced to homebirthing. It is a great idea and the motivation in which I created this printable. From my experience childbirth’s sorrows (during labor and after) have been one of the most humbling experiences in my life to which I truly felt my limited ability and had to rely wholly upon God to bring me through the process. I prayed, I called and cried out to God for His help, and I thanked Him in each birth when it was over with eyes full of joyous and relief-filled tears. He had heard, He had helped, He gave us an indescribable gift of a child. I have not always gone through the past four labors with right thoughts and it is my goal this pregnancy to prepare my heart and mind to think on God more this labor than I have before. This list of affirmations – simply, true statements to encourage during labor that are Christ-centered. I have also created a list of Bible verses to think and dwell on. These verses focus on faith, strength, prayer, the reward of the child God created being joined to our family, and can help you through each phase of your pregnancy, labor, and postpartum experience. I have included many of the verses and affirmations in this post, but have also designed a free printable to be able to print off on your computer and have with you during your birth. The printable has more verses and affirmations than are listed here. God designed my body to birth naturally. I trust God to guide my baby through the body. Have patience, the baby will arrive in God’s timing. Labor is good. God is good. Baby is good. Faith allows the natural process to keep happening. God chose this day for my baby’s birth day! “Peace, be still.” Breathe slowly and deeply. Rest in the Lord between contractions. 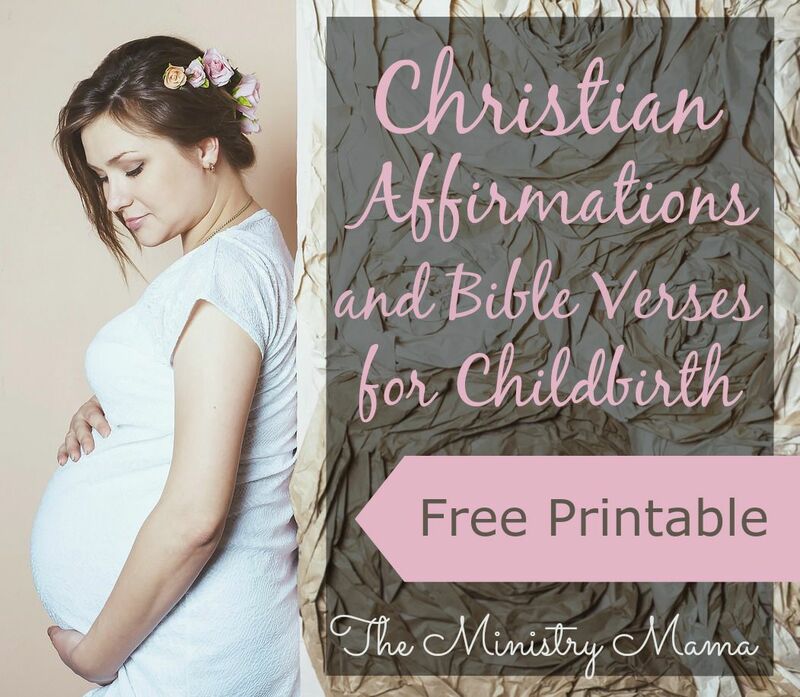 You can download Child Birth Affirmations & Bible Verses. Please remember that these printables are for personal and church use only. If you like this link, please link back to this page and website, do not provide this content on your own personal web page or in any other manner.